The Silk Road-inspired spot has become a juice bar. 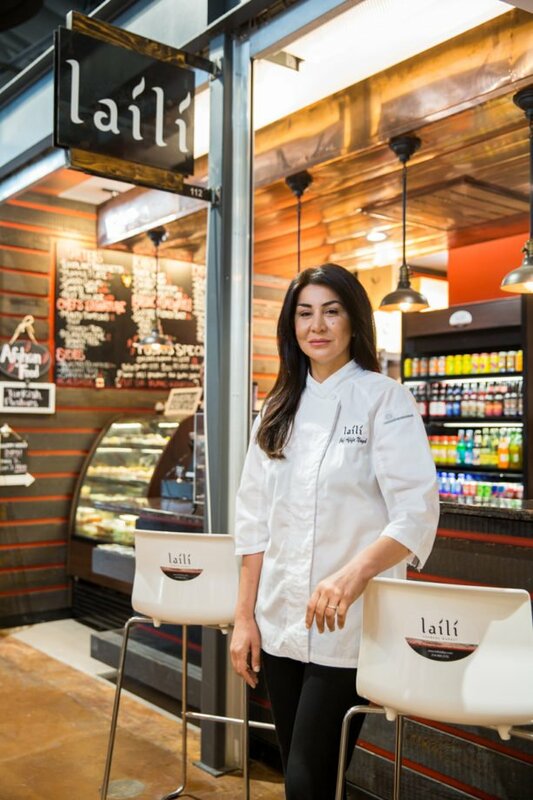 Laili, Afifa Nayeb’s spot tucked next to a tamale vendor and Bullzerks’ sassy t-shirts still has its custard French toast for weekend brunch, when hordes descend on the Dallas Farmers Market Shed. They’ve also kept the wraps, with flavorful roasted potatoes and creamy cilantro sauce. But the focus has shifted since I wrote about Laili in a round-up of what I called four new stars at the then-fledgling farmers market annex. Laili’s Afghani fare included mantoo dumplings with a tofu-spinach filling. The menu leaned vegetarian. You could also get Turkish coffee next to a flaky baklava. Since then, Nayeb has continued her health-conscious bent and pursued it into the realm of juices and smoothies. Now, hers is a spot for fresh juice and the probiotic goodness of a “shakegurt,” one of a number of smoothies made with tart Bulgarian yogurt. I love the yogurt smoothies, which have a refreshing tartness that balances the sweetness of fruit and promises good things for your gut. I love, for example, the Mango Lassi, with a touch a honey. Others blend the Bulgarian yogurt with berries, or in one it gets whirled around with dried figs and almonds and a kiss of honey. As for the juices, the Go Green Detox, blends Persian cucumber with kale, spinach, celery, a little sweetness from green apple. For the Metabolic Booster, fresh pineapple goes into the juicer with cucumber, kale, spinach, and a nub of turmeric. There are concoctions with beets, one where ginger and cayenne join carrot and orange, and a beautiful simple one with pineapple, mint, and green apple. The ingredients lists—and particularly the use of that Persian cucumber, mint, and yogurt—give you a sense that Laili’s liquid fare is still inspired by the Silk Road.